The DigiSolver, a Digital Resolver, is a resolver-based encoder, in which the analog signal produced by a brushless resolver is transformed into a digital format by a built-in ratiometric­tracking converter. This new concept and the advanced patented technology of the DigiSolver with fully potted electronic circuitry, provide higher accuracy, increased reliability, higher operating speeds, more flexible counts-per-turn, and a smaller size than optical encoders. There is no optically coded disc or similar components used in the DigiSolver. A miniature Mil-Grade resolver produces an analog position signal and high-grade electronics inside the same housing transforms this signal to digital format. 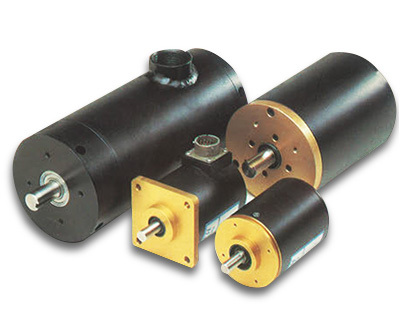 The resolver is a passive transducer, well known for its ruggedness and performance in hostile industrial environments. The DigiSolver combines the ruggedness of a resolver with the reliability of solid-state electronics and is designed to operate reliably under severe environmental conditions, such as mechanical shock, vibrations, temperature and humidity changes, oil mist, coolants and solvents. No broken discs! No disc misalignments! No LED aging! Up to 13-bit Binary, Gray Code, or BCD in Size 25; (E7N series), Size 40 (E5N series) or explosion-proof housing (E8N series). Up to 13-bit Binary, Gray Code, or BCD in Size 40 (E5N series) or explosion-proof housing (E8N series) with a wide-range of internal gear trains. 18-bit Binary over 64 turns; 15-bit BCD or Standard Gray over 32 turns; Size 40 (E5N series) or explosion­proof housing (E8N series). Internal gear train ratios of 64:1 or 32:1. The DigiSolver is an absolute encoder; that is, it keeps track of the exact shaft position even during power outage or switching-off the machine. At power-up, the DigiSolver's output will indicate the exact shaft position, even if the machine moved during the power outage. In a single-turn operation, the machine cycle is completed during one complete revolution of the transducer shaft, whereas in a multi-turn operation the transducer shaft needs to make more than one turn for a complete machine cycle. The DigiSolver is factory-wired for ascending counts with CCW shaft rotation. However, the direction of operation can be easily selected in the field by opening-up the case and simply reversing the resolver input plug. No wires need to be unsoldered or soldered. Also an optional external toggle switch is available for selection of ascending counts direction without opening up the unit. The AVG Automation ratiometric-tracking converter is practi- cally immune to electrical noise, voltage, frequency, and temperature variations, with slew speeds up to 5000 RPM. 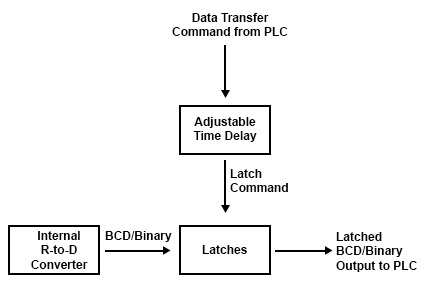 An optional PLC-synchronization circuit is provided to assure reliable data transfer to PLCs. The edge-triggered device allows data to be updated every scan and a variety of outputs (TTL, PNP, or NPN) permit interface to virtually all existing PLCs. To match almost any application, the DigiSolver is available in various mounting styles and housings. The housing Size 25 and 40 are standard for single-turn units, whereas the multi­turn units are available only in a Size 40 housing. Size 25-2.5" (63.5 mm) dia., NEMA 13 housing is designed for medium-duty applications and is available for flange or servo mount with an MS-connector located at the end or on the side. The Size 40-4.0" (101.6 mm) dia., NEMA 13 housing with internal helical coupling and double bearing is designed for heavy duty applications and is available for face mount with end-mounted MS-connector or conduit fitting. Explosion-proof-FM approved, Division 1, Class 1, Groups B, C, and D units comes in Size 40-4.0" (101.6 mm) dia. housings for both single-turn and multi-turn models. The DigiSolver is available with Binary, Gray Code, BCD, or Analog absolute position output formats. A further flexibility to interface to other devices is provided by TTL (5 V logic), PNP (sourcing) transistor (50 VDC @ 100 mA) or NPN (sinking) transistor (50 VDC @ 100 niA)-types of outputs. The analog position or tach output can be 0-10 VDC or 4-20 mA signal. Velocity, Direction, Count, and Reference Outputs In addition to the above described position outputs, optional analog velocity (0- 10 VDC or 4-20 mA), direction, count, and reference marker outputs are also available. This is especially useful in servo control systems, where position and velocity feedback is required. In such cases the DigiSolver can replace both the position transducer and the tachometer. The standard models are available, which can operate with either a 5 VDC or 8-30 VDC power supply. This wide-voltage range provides an increased flexibility in using the DigiSolver in control systems of different voltage levels without requiring an extra power supply. An existing power supply can be used to power the DigiSolver, that is, if a PLC operates at 24 VDC, an 8-30 VDC DigiSolver model can be connected to the same power supply, cutting system costs. The advanced R-to-D converter used in the DigiSolver has made it possible to order any number of scaled BCD counts­per-revolution. The BCD output with counts-per-turn of 360, 1000, and 3600 is standard. However, the unit can be delivered with custom-scaled counts if so desired. The TTL-type output of the DigiSolver is provided with tristate capability and can be wired logic-OR. This allows more than one unit to be connected to the same input of a PLC. Very often electricians try to make or change connections under power and that is when various electrical devices are damaged by shorting. The DigiSolver is available with short­circuit-proof PNP (sourcing) transistor outputs. An accidental short on the DigiSolver's output will not damage the unit. When short-circuit-proof outputs are ordered, field-selectable direction-of-rotation for ascending counts is also provided.